Alfa Romeo Tipo A Monoposto was the first monoposto (single-seater) racing car, designed by Alfa Romeo. 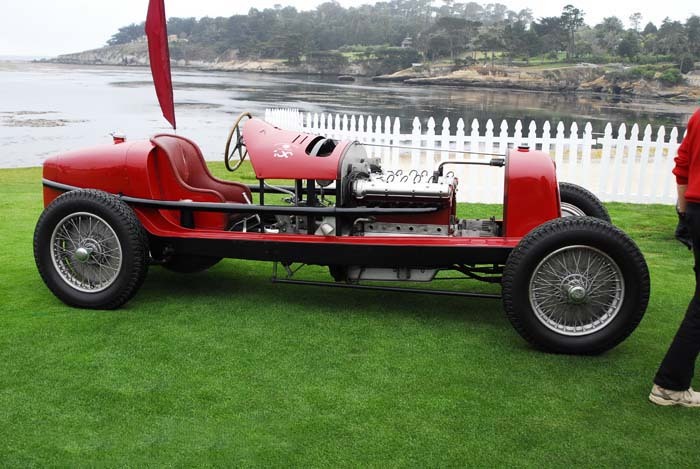 The car had two 6C 1750 straight-6 engines and gearboxes assembled side by side. Producing 230 bhp (172 kW), the car had top speed of 149 mph (240 km/h). The car's best racing achievement was in the Coppa Acerbo of 1931; Tazio Nuvolari was third with Giuseppe Campari winning. Luigi Arcangeli was killed at Monza in 1931 while practising with this car for the Italian GP. The car's complex design ultimately led to it being very unreliable; Jano started to design a new car, the Tipo B (P3), to fix this problem. The Tipo A was made only four examples and only one replica exist today in Alfa Romeo Historical Museum in Arese. Last updated on 10 March 2014 at 23:08.